Boston's George B. Stone & Son produced more than 800 Master-Model Drums after its introduction as the company's flagship snare drum offering in 1922. The most commonly applied finish is what Stone cataloged as "Black De Luxe". Second most common is the natural maple finish seen here. 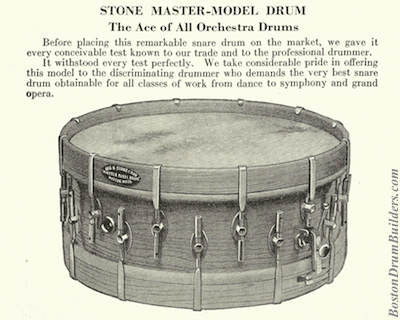 Stone & Son heralded their Master-Model as "The Ace of All Orchestra Drums" proclaiming that it was "easiest playing and best tone snare drum in the world." 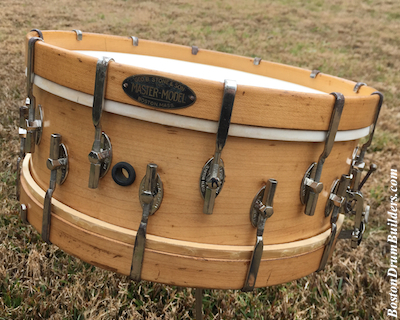 The three ply maple shell, a feature unique to Stone at that time, was "guaranteed not to split, warp, or crack." Describing how the drum was set up before leaving the factory, Catalog K (1925) states "Both heads are of the most durable, first quality calf, specially selected and treated to withstand dampness" and that "Each Master-Model is equipped with snare strainer and muffler attachment of a new design, also the best coiled wire snares". 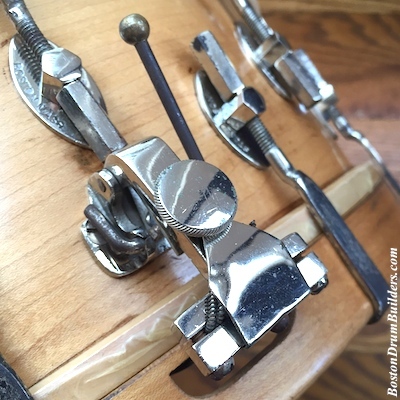 True to Stone's intentions, the original snare wires and new calfskin heads adorn this example. 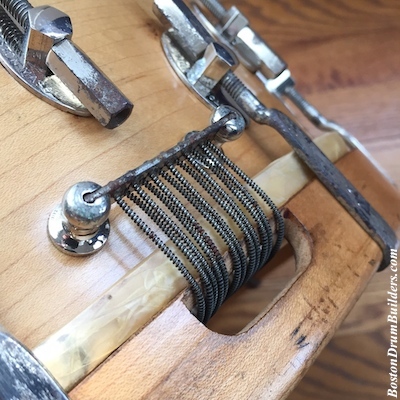 And note the small metal tab attached to the strainer which keeps the knob securely in place - a small piece which frequently goes missing or is removed and misplaced. Equally as interesting as the period correct setup is the provenance associated with this drum. So often the story is lost over the decades of who originally owned the drum. In this case however, we can trace ownership all the way back to the beginning because the drum remained with the family for nearly 90 years before it was purchased from the owner's granddaughter. Ernest Rhys Llewellyn was born in Auburn, Massachusetts on July 2, 1888. A patent attorney by trade, Llewellyn was also something of an inventor himself receiving three patents for designs of his own pertaining to locking screws and a power transmitting mechanism. According to his family, he was also an architect, a Free Mason, an award winning field dog breeder, a small arms instructor for the U. S. Coast Guard during the second World War, and at one time owned an office equipment retail store in Manchester, New Hampshire. And somehow in addition to all of this, he apparently found time to play drums. Mr. Llewellyn lived out his later years in Arlington, Massachusetts, his possessions eventually ending up in a wooden shipping crate relegated to the basement for storage after his death. 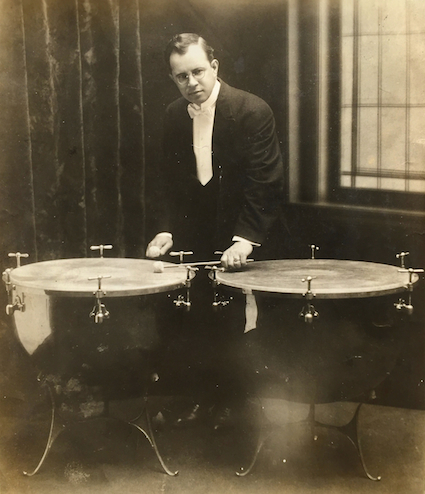 His timpani were long ago donated to a local Massachusetts high school, and his snare drum has now found its way into the author's personal collection. As a nice touch, included with the drum were several pairs of sticks complete bearing the etched initials of Llewellyn's granddaughter who briefly played the drum as a junior high school student. Do you have a drum made by George B. Stone & Son? I'd love to hear from you! Feel free to send Lee an email anytime at lee@vinson.net. And for more on George B. Stone & Son Inc. and the other early 20th century drum manufacturers of Boston, Massachusetts, please visit BostonDrumBuilders.com.